Toms River Regional Schools joined other awarded schools and districts at a Jan. 10 grants luncheon on the campus of The College of New Jersey. The event was hosted by Sustainable Jersey for Schools and the NJEA. 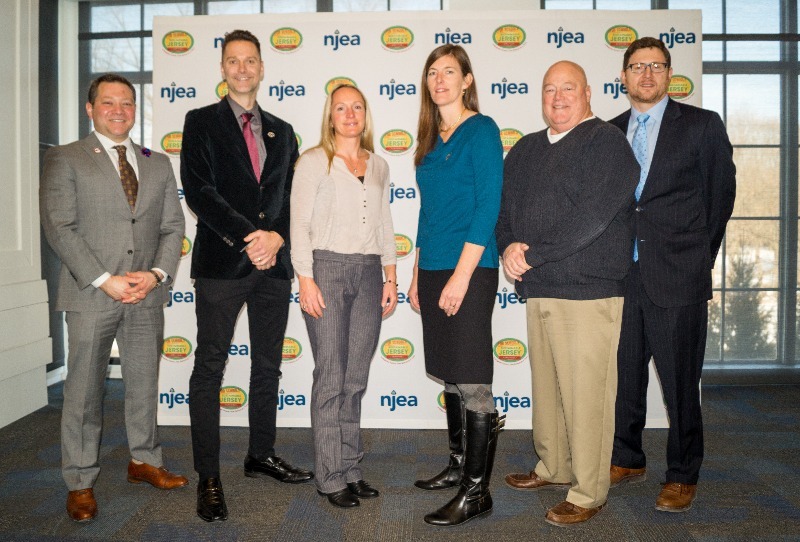 From left to right: Steve Beatty, Secretary Treasurer, New Jersey Education Association; Mike Kenny, Grant Writer, TRRS; Kelly Natke, Teacher, Intermediate East; Christine Girtain, Teacher, High School South; Scott Campbell, Toms River Education Association President; and Randall Solomon, Executive Director of Sustainable Jersey. Sustainable Jersey for Schools and the New Jersey Education Association (NJEA) announced that Toms River High School South and Intermediate East have been awarded $10,000 and $2,000 Sustainable Jersey for Schools grants, respectively. Eleven $10,000 grants and thirty-five $2,000 grants were distributed across the state to fund a variety of projects including vertical aeroponic tower gardens, agricultural and sustainability curriculum, student green team capacity building, an outdoor classroom, a healthy habits program, enhanced recycling efforts and more. With this contribution NJEA has provided $750,000 to support a sustainable future for children across the state through the Sustainable Jersey for Schools program. “This is an important program that directs resources into our schools and NJEA is proud to continue to work with Sustainable Jersey,” said NJEA Vice President Sean Spiller. “It is our job to help create a new generation of engaged citizens and leaders. We help ensure that we leave a better world for our students when we emphasize the value of sustainability.” In addition to the grant funding, NJEA supports Sustainable Jersey for Schools as a program underwriter. The High School South project proposal was led by science teacher Christine Girtain. HSS will partner with the Bordenstein Lab at Vanderbilt University to provide a cadre of rising 11th and 12th grade Authentic Science Research (ASR) students the opportunity to participate in the Wolbachia Summer Research Project, a local and international initiative to contribute to the national Wolbachia database and to teach high school students about managing mosquito populations using techniques that use molecular/microbiology. The Lab will provide online technical assistance and research materials to the school. This research could provide a sustainable means of managing mosquito population through biological pest control that could eventually contribute to a decline in New Jersey mosquito populations and the spread of Dengue and Zika viruses. The project at Intermediate East will be led by teacher Kelly Natke, who will utilize grant funding to update the school’s greenhouse with a heater, more planter boxes and irrigation supplies to ensure that more students can participate in educational opportunities year-round. The fruits and vegetables harvested will be used in the school's cafeteria and cooking classes. Toms River Regional Schools currently has five of its schools registered with Sustainable Jersey. In combination with its participation in Toms River Township’s Green Team, the district has earned $36k in Sustainable Jersey grants in the past year alone. The district’s Green Team, comprised of school staff, admin, facilities and food services personnel, meets monthly, collaborating to apply for available grants and attain Sustainable Jersey certification for schools. Sustainable Jersey for Schools is a certification program for public schools in New Jersey. It was launched by Sustainable Jersey, an organization that provides tools, training and financial incentives to support and reward municipalities and schools as they pursue sustainability programs. To date, 290 school districts and 712 schools are participating in the program. Sustainable Jersey for Schools has awarded over $1.3 million in grants to schools and school districts. To learn more, visit www.SustainableJerseySchools.com. High School South Authentic Science Research (ASR) teacher Christine Girtain describes her Wolbachia Summer Project to her fellow grant winners at the Jan. 10 awards event. Ms. Girtain's project was among the most unique of the $10k awards, and several in attendance commented positively on its scientific depth and originality. 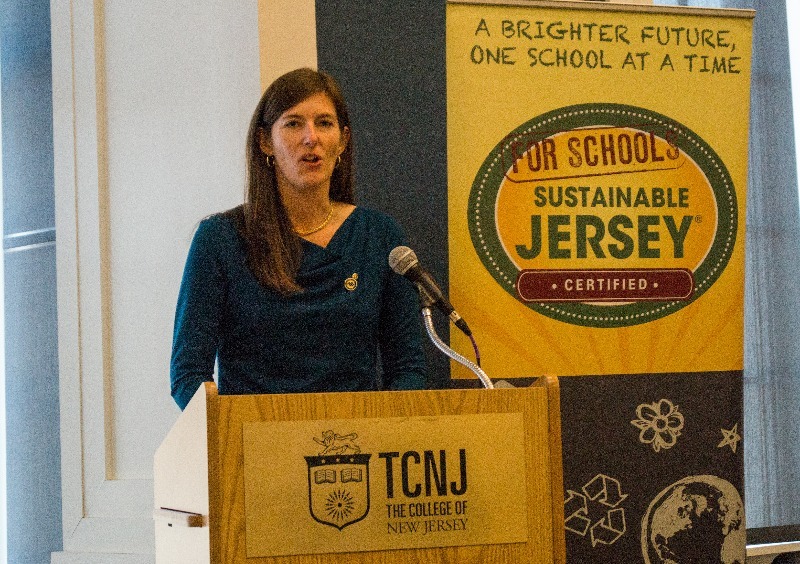 Sustainable Jersey for Schools is a certification program for public schools in New Jersey. It was launched by Sustainable Jersey, an organization that provides tools, training and financial incentives to support and reward municipalities and schools as they pursue sustainability programs. Since becoming a registered district in 2017, and in combination with its participation in Toms River Township’s Green Team, the district has earned $36k in Sustainable Jersey grants to implement projects that foster a more sustainable future.